Located in Zone 2, between Surrey Quays and Southwark Park, Landale House student accommodation is perfectly situated for getting about London. 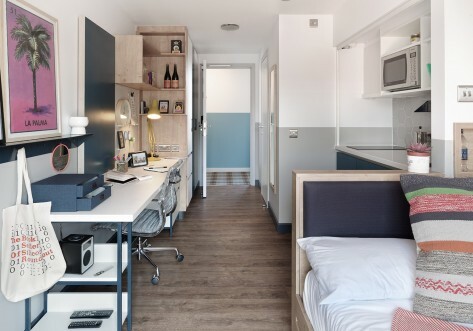 This stylish student accommodation is friendly and sociable and you’re sure to meet a wide range of interesting people. 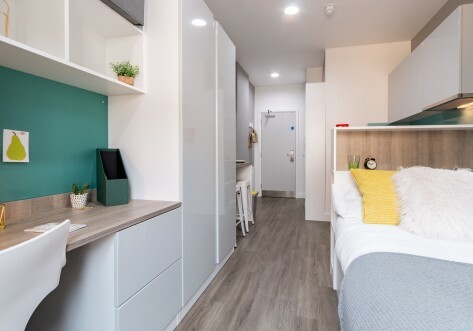 Landale House is the perfect student accommodation for wanting to live with your friends and live close to some of Londons most popular attractions! 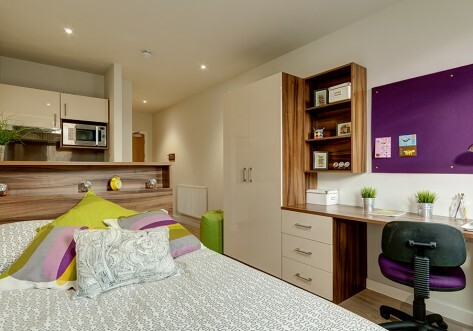 Your student room at Landale House comes with a large, comfortable bed, a study desk and ample storage space. Each shared student flat comes with a modern shower room, an integrated kitchen area, and a TV for all your entertainment needs. Landale House provides the perfect combination for when you want to socialise and when you need your own space. There is 100Mbps WiFi throughout the entire building, an on-site laundry and secure bike storage. 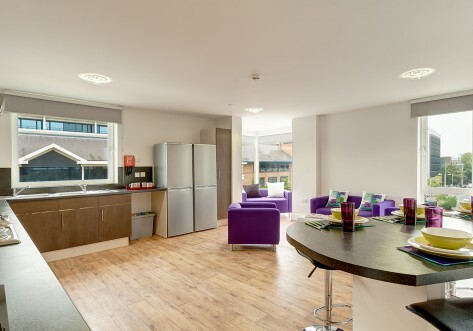 The communal area is designed to bring residents together on social occasions, and is fully equipped with a pool table, games console and a TV. The on-site hospitality team is dedicated to helping you make the most of the facilities at Landale House and the wider area, while the building has CCTV cameras which are monitored by the on-site security team to give you that essential feeling of safety and security. Landale House, located in Zone 2, is a three minute walk away from Canada Water and Surreys Quay Tube stations. Also within easy walking distance is Surrey Quays where you’ll find a range of high street shops, such as River Island, Starbucks and a Tesco’s supermarket. When you have shopped, why not take in a film at the Odeon Cinema or enjoy a drink at one of the many bars and cafes? Landale House’s proximity to the London rail network means the fabulous bars and restaurants of Islington and Shoreditch are only a short ride away, as is the city centre where you can find the Tower of London, the London Eye and many more must-see tourist attractions. Close by is Southwark Park where you can take part in athletics or merely relax in the glorious 63 acre park. You can also visit the CGP London gallery to take in a contemporary art exhibition by the pool. You can walk to Central Greenwich College and Morley College at BEC from Landale House which takes around seven minutes. Other universities and colleges are easily accessible via DLR, Tube or bus, making Landale House a great place to experience student living in the nation’s capital and experience all the city has to offer. Bedroom within shared flat with a ¾ bed, study area and wardrobe. Shared facilities consist of kitchen area with breakfast bar and TV, shower room and toilet. Up to 100Mbps WIFI throughout. Lower Ground bedroom within shared flat with a ¾ bed, study area and wardrobe. Shared facilities consist of a small lounge and kitchen area with TV and bathroom. Up to 100Mbps WIFI throughout. Bedroom within shared flat with a ¾ bed, study area and wardrobe. Bedroom has an attached private balcony. Shared facilities consist of kitchen area with breakfast bar and TV, shower room and toilet. Up to 100Mbps WIFI throughout. Lower Ground en-suite bedroom within shared flat with a ¾ bed, en-suite bathroom, study area and wardrobe. Shared facilities consist of a small lounge and kitchen area with TV. Up to 100Mbps WIFI throughout. Large bedroom within shared flat with a ¾ bed, study area and wardrobe. Bedroom has an attached private balcony. Shared facilities consist of kitchen area with breakfast bar and TV, shower room and toilet. Up to 100Mbps WIFI throughout.